Folks from TSLA will be in Rogersville and Elizabethton next week for the Looking Back: The Civil War in Tennessee project (www.tncivilwar150.org). This may be their last trip to the northeastern corner of Tennessee, other than the final “signature event” in Knoxville April 30-May 1, 2015. Items will be digitized and not taken from the owners. TSLA will protect identities of the owners, and will send them copies of the digital images they use. Attached are the registration forms for each event, found online here: http://www.tennessee.gov/tsla/cwtn/events.htm. You can also access the online casino Carter County form by clicking here and the Hawkins County form by clicking here. Generally, it’s best if people call or email their reservations, and do it by Tuesday, Dec. 2, since the team will be on the road on Wednesday and Thursday. Walk-ins are welcome, but they”ll see folks with appointments first. Just a note about what’s eligible for the project . . . TSLA asks that people bring in original items. Photocopies of their research, including Civil War Service Records, cannot be scanned for the project. They can make photocopies for vertical files. Items do not have to be Tennessee-related, though we do focus on Tennessee. They’ve had a lot of interesting items from other states, brought in by people whose descendants now live in Tennessee. All seating times are now sold out including 3 p.m., 4:10 p.m., 5:20 p.m., 6:30 p.m. and 7:40 p.m. 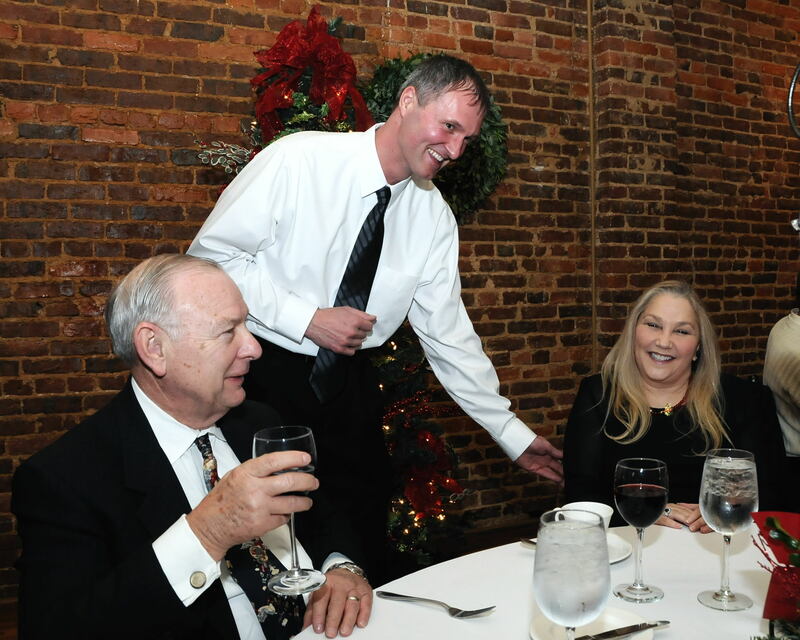 The magic of Tennessee’s oldest town comes alive during the annual Progressive Dinner hosted by the Heritage Alliance of Northeast Tennessee and Southwest Virginia. This year’s dinner takes place on the evening of Sat., Dec. 6 with a variety of seating times including 3 p.m., 4:10 p.m., 5:20 p.m., 6:30 p.m. and 7:40 p.m. However, all seating times are now sold out due to an overwhelming response from folks across the region. Now in its 37th year, the Progressive Dinner provides an enchanting evening of great food, good friends, holiday music and an insider’s look at some of Jonesborough’s spectacular historic structures. 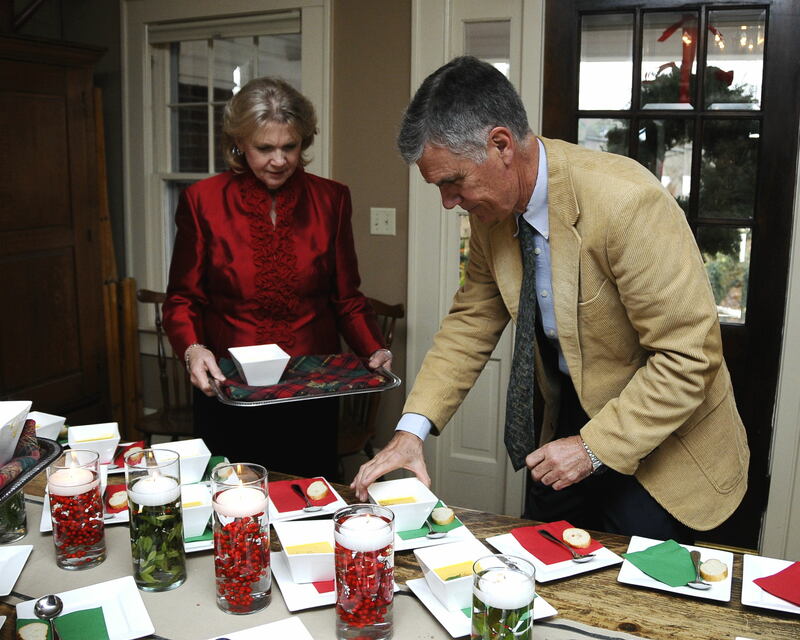 Begun as a way to celebrate Tennessee’s Oldest Town’s historic preservation efforts, the event is still the main fundraiser for the Heritage Alliance, this region’s local partner of the National Trust for Historic Preservation and Jonesborough’s preservation specialists. 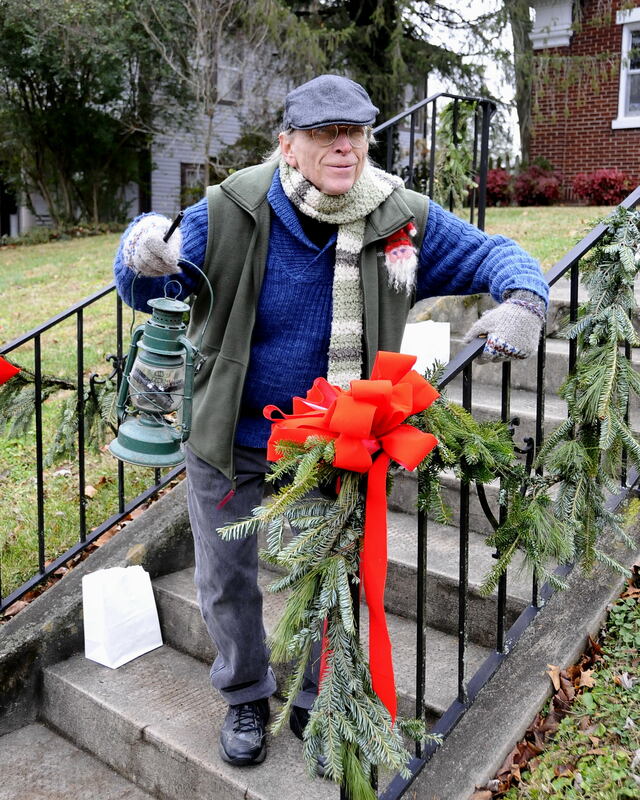 Guests will be escorted to five historic structures during the evening as each location features a different course, live holiday music and the signature warmth and hospitality of Jonesborough. Structures are chosen to highlight the diverse architectural styles and periods represented by Jonesborough’s beautifully preserved Historic District. Three of the structures include private homes. By combining public and private buildings with various styles and periods, the Progressive Dinner takes you back to holidays past and offers a calming atmosphere from the hustle and bustle of today’s holiday season. The main event begins at the state owned Chester Inn Museum and ends at a private home located in Jonesborough. The meal is provided by locally owned Main Street Café & Catering with the dessert by Embree House Wedding Cakes, Patricia nbso online casino reviews Stern and Ginine Argueta. 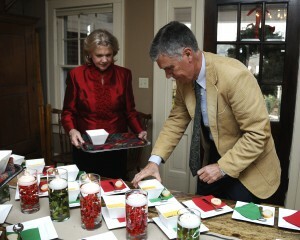 The Progressive dinner has become a traditional start to the holidays for many people throughout East Tennessee and surrounding states. Seasonal music by several of our area’s finest musicians, including the ever popular Jonesborough Novelty Band, gourmet food, memorable camaraderie and great fun are the hallmarks of this popular event. Another aspect that makes Jonesborough’s Progressive Dinner a memorable tradition is the volunteers. 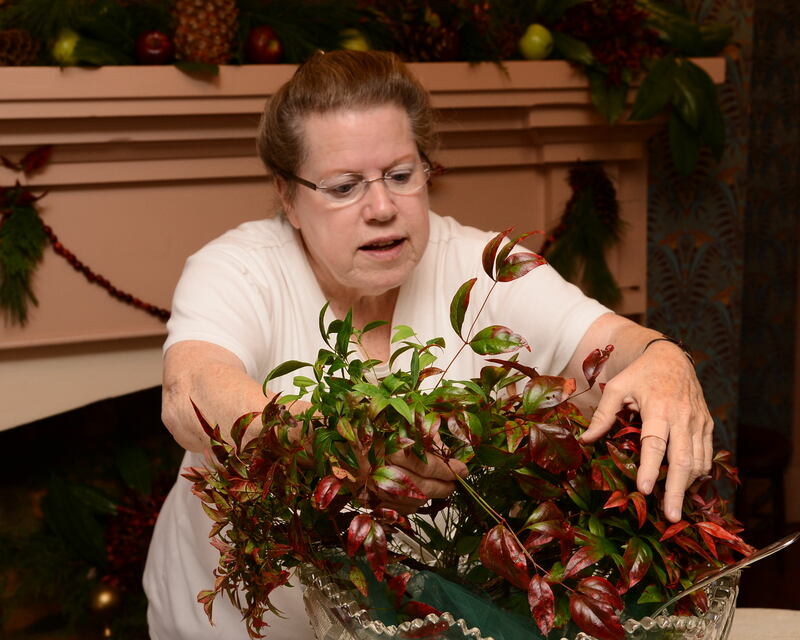 Executive Director of the Heritage Alliance Deborah Montanti estimates that in order for the event to run smoothly, nearly 80 volunteers are needed in a variety of forms. 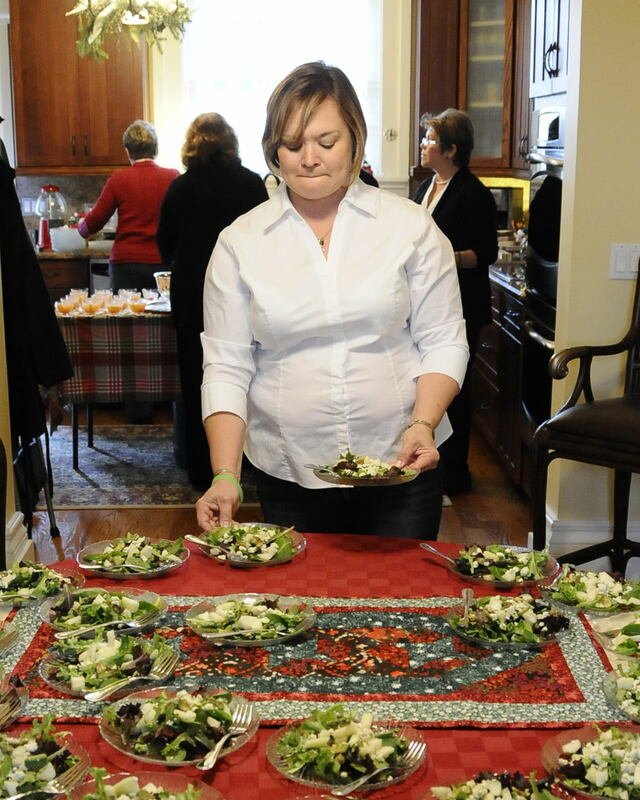 Hawley has been involved with the Progressive Dinner in a variety of capacities, including hosting the dinner in her home, washing dishes, serving food and cooking several of the courses. Volunteers are still needed for the 37th Annual Progressive Dinner on Dec. 6. Anyone interested in supporting the event may contact the Heritage Alliance at 423-753-9580. 2015 Progressive Dinner tickets will become available to the public in late August 2015. To be added to a contact list for Progressive Dinner ticket sales, contact the Heritage Alliance at 423-753-9580 or email info@heritageall.org. 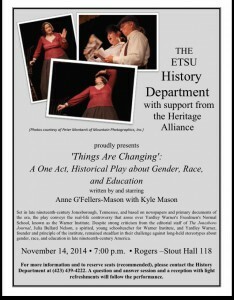 The History Department at East Tennessee State University with support from the Heritage Alliance of Northeast Tennessee and Southwest Virginia, invites alumni, students, and community members to a performance of 2013 graduate Anne G’Fellers-Mason’s play “Things Are Changing’: A One-Act Historical Play about Gender, Race, and Education.” Set in late nineteenth-century Jonesborough, Tennessee, and based on newspapers and primary documents of the era, the play conveys the real-life controversy that arose over Yardley Warner”s Freedmen”s Normal School, known as the Warner Institute. Despite strong criticism from the editorial staff of The Jonesboro Journal, Julia Bullard Nelson, a spirited, young schoolteacher for Warner Institute, and Yardley Warner, founder and principle of the institute, online casino remained steadfast in their challenge against long-held stereotypes about gender, race, and education in late nineteenth-century America. The performance will be held in 118 Rogers-Stout Hall at 7:00 pm on Friday, November 14. 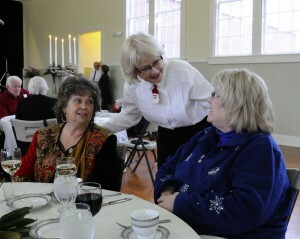 A question-and-answer session and a reception with light refreshments will follow the production. This event is free and open to the public, but anyone wishing to attend should contact the History Department at (423) 439-4222 or email the department at historyofu@etsu.edu to ensure that seats remain available. To view the flyer, please click here.